The Little Spartan program focuses on the most basic and simple self-defense techniques and basic verbal confrontation avoidance techniques. Students are taught to follow commands within a specific time frame and to express themselves verbally not physically. Students participate in in-class discussions about bullies, strangers, exercise and health. Each Little Spartan class consists of a challenging warm up, solo-drills, a partner technique, and training or a game. Solo-Drills will allow students to improve their coordination and master the body movements that will be used in their Brazilian Jiu-Jitsu techniques. Partner techniques are the actual physical techniques of Brazilian Jiu-Jitsu. They will work these against their teammates or one of the coaches. And then finally, we have developed several “games” in which we implement the techniques that they have learned. This allows the students to learn in a fun way while developing their coordination and reflexes. 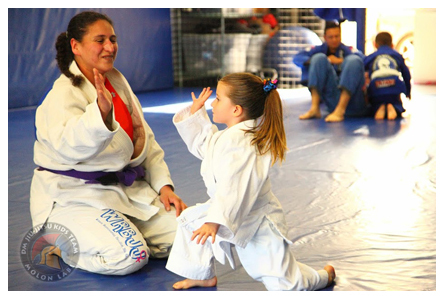 Our instructors are trained to always keep the children motivated and at the same time disciplined. Another thing that sets our Little Spartan Program apart from other kids Brazilian Jiu-Jitsu programs is that we regularly have not just one or two coaches per class... but three to four coaches per class instead! Little Spartans have developing minds that need personal attention. By having more qualified coaches on the mat at the same time it will guarantee to maximize each of our students learning experience. 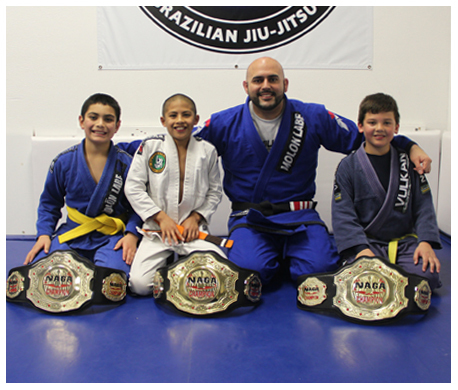 What sets the DM Brazilian Jiu-Jitsu Academy youth programs apart from other schools? Our Youth Program has 2 different class groups, separated according to age and maturity level. This allows the kids to learn verbal and physical techniques that apply to physical attacks and verbal dialogs of their age group. It also allows us to teach them leadership by being the oldest in one class, then teach them to take on new challenges when we graduate them to the next class and they become the youngest in their new group. 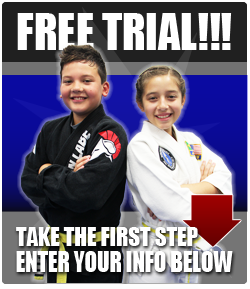 Here at our school your child or teen will learn from World BJJ Champion Professor Dimitrios Mavraganis, and 2nd degree black belt under Master Rigan Machado and the Machado brothers. The techniques they will learn were developed by the Gracie and Machado family and passed down to Professor Dimitrios and his staff as a way to defend against bigger and more athletic attackers. Bullying is most prevalent in this age group. We focus our program on basic self-defense techniques that will help our students defend themselves from any situation that may arise including confrontation-avoidance dialogues. We often have class discussions about bullies and what to do in specific situations. In the Spartan Champions Program our students also start to spar on a regular basis. After learning the moves, sparring is the most important part of their progression. Sparring works their reflexes in real time situations and is the closest thing to defending themselves against an attacker in real life. 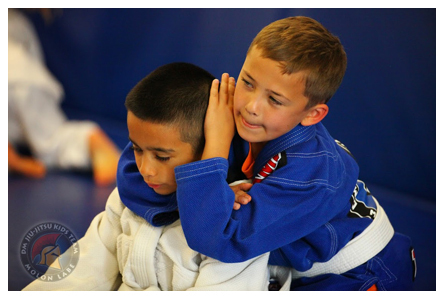 Children who maintain a steady training schedule are allowed to enter Brazilian Jiu-Jitsu competitions. Courage, Self Control, Respect, Discipline, while at the same time having fun! 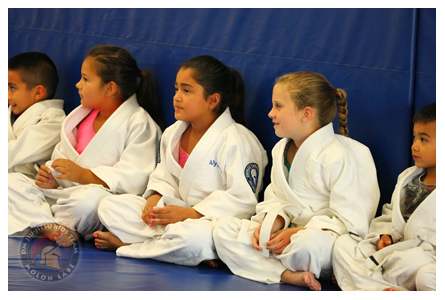 In the DMBJJ Spartan Champions program your child’s concentration, coordination and fitness level will also increase. Our program also focuses on improving children’s listening and motor skills. These skills will help them enter society with more confidence and enthusiasm. There are eight major skills our instructors focus on when training children ages four to fifteen. Those skills are: focus, teamwork, control, balance, memory, discipline, fitness and coordination. In each class we cover at least one of these skills with a wide variety of activities that are fun and at the same time educational. All skills are taught in a safe and supervised environment. Our instructors, programs, curriculums, and methods of teaching have earned 5 stars reviews from all of our DMBJJ parents! The martial art of Brazilian Jiu-Jitsu is a great educational gift for you to give to your children.